While on my recent 2-week journey across Japan, I had the chance to read Elizabeth Gilbert’s Eat, Pray, Love: One Woman’s Search for Everything Across Italy, India and Indonesia. And because I underestimated how much time I’d have on the trains, I ended up reading it not just once, but twice. And yet, I enjoyed it as much the second time round as the first. 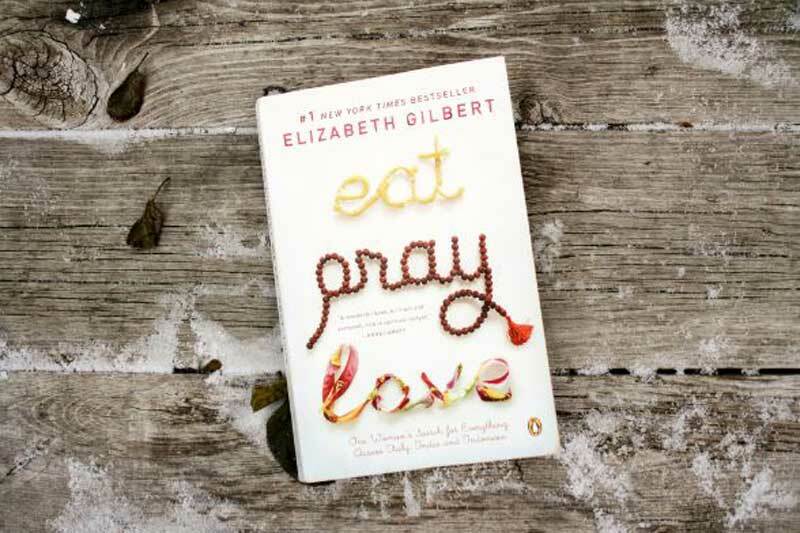 Eat, Pray, Love is the story of Elizabeth’s travels through Italy, India and Bali as she struggles out of a recent divorce and turbulent love affair, in search of the three things she has been missing in her life: pleasure, devotion and balance. She first travels to Italy, where she learns Italian and gains twenty-five pounds from pampering herself with the delicious local food. I lived voraciously through her delicious accounts of Italian pasta, cappuccinos, pizzas, and her wanton exploration of the local delights inspired me to try out as many eats as I could while in Japan. Being a wordie myself, I also enjoyed learning a tad of Italian through her (her translation of a football fan’s rambling curses on page 72 is hilarious), especially her favorite Italian word: attraversiamo (“let’s cross over”). I imagined rolling my tongue around the words as she did and I gained a deeper appreciation of this beautiful language through her. After four months enjoying a life of leisure, learning and eating, Elizabeth hits the other extreme by traveling to an ashram located “far away from Mumbai, on a dirt road in a rural river valley near a pretty and scrappy little village” in faraway India, where she gets up at 3 in the mornings for meditation and service and ends her days 9 at night. It’s here, I think, that Elizabeth faces her inner demons for the first time. There’s something about meditation, as I found out doing my own meditation retreat in Thailand , that forces you to look at yourself starkly, not in a metaphorical way, but in a right-smack-in-your-face way as you deal with the negative stuff that comes up. While I was reading her experience of meditation for the first time, I wanted to jump up in the middle of the shinkansen (Japan’s bullet train) and shout ‘yes! it was like that!” again and again. I can’t speak for others, but her recount of the inner difficulties she went through in meditation was pretty much the same for me. In the last leg of her journey, Elizabeth travels to Bali, where a local medicine man has promised to teach her everything he knows. It’s interesting to see how differently Elizabeth deals with people and situations now that she’s been through the pleasures of Italy and the trials of India. I won’t spoil it for you, but this is a chapter where things manage to round up nicely for her. I’m surprised to see so many negative reviews of her book on Amazon (the average score still turns out a high 4 out of 5 stars). Some accuse her of being utterly self-centered and selfish, but I never thought that while reading her. Instead, I got a sense of a flawed but honest person, and it’s this honesty in her writing that endears me to her book. She doesn’t gloss over the ugly bits she had to go through nor the mistakes she’s made, but her imperfections makes you root for her more. The book may sound like a dreary, sombre soul-searching sojourn, but Eat, Pray, Love is actually pretty hilarious. Elizabeth spares no account poking fun at herself and never loses her sense of humor while going through the worse bits. I loved Eat, Pray, Love, it was a witty, enjoyable and insightful read, and I recommend it highly.